Today, 7/14/10, is Bastille Day in France, for Liberty, Equality, Fraternity and their Revolution. Tragically, Obama has violated his oath of office to protect and defend America from foreign and domestic enemies, with his total committment to everything Islam and to those committed to “Death to Israel” and “Death to America”, resulting in 11 domestic terrorist events just in the U.S. in 2009. He has appointed every political incompetent and hack who backs this Jihadist president and his Jihadist agenda. America and Israel are in great danger as a result of this betrayal and treachery and where anyone who dares to expose this fraud is labeled a ‘racist’, etc. In spite of the pro-Obama/Muslim media, 60% of Americans are not buying Obama any longer. Below are two vital articles demanding your attention and explanation as phase one of this ‘impeachment’ which I am pursuing as an ‘independent’ candidate for Congress, Dist. 20, and against Rep. Debbi Wasserman Schultz (Schmutz), Obma’s #1 lap dog and mouth piece, who told the Jews we could trust Obama on Israel and it was all lies from both of them. What kind of Jew would divide Jerusalem, Jewish for 3000 yrs. and millions of Jews were murdered for? SCHULTZ of course. What kind of Jew would remain silent when Obama equated in Cairo, in 2009, that the “Holocaust” was equal to “Muslim Humiliation”? SCHULTZ of course. What kind of Jew would allow Obama to attack Israel for protecting the buriel place of Abraham, Isaac and Jacob and their wives, as a ‘provocation” to the Muslims, when Abraham the first Jew and our forefather,bought his burial place which is 3000 yrs. older than Islam? SCHULTZ of course. Debbie Wasserman Schultz is that kind of sell-out Jew on this and a host of other outrageous attacks upon Israel and our faith…. by this career politician, who wants to be Nancy Pelosi’s replacement and Schultz keeps plugging for Obama who should be held ‘criminally negligent’ for the Gulf Oil catastrophe, now in day 86, who could care less about this issue, when he was and is so busy trying to divide and conquer Israel, instead of how to save America, whether in jobs, security, environment and a host of other failures jeapordizing America’s survival and thrival. Today, this Jew, Kunst, led our 311th rally, since Oct. 2007 and 1205 news interviews, inside Century Village and also on Pine Rd. at entrance to Century Village,in Pembroke Pines, to Keep Jerusalem and Israel United and to Fight terrorism and the Islamic Nazis, Obama supports. Do you understand that there are 3 republicans running against Schmutz, who are very weak and can’t beat Schultz, but I can as an ‘activist Jew’, not a politician, registered Democrat, but running as an independent in the November election. Is the issue to save the GOP going nowhere in this district or to defeat Obama and Schmutz? Can you imagine the impact of defeating Obama and his #1, on Congress and cleaning out the ‘schmutz’? That is all the bad people in Congress that now only has 11% support from grassroots America. Besides committing myself to immediately begin ‘impeachment’ proceedings against Obama, I also plan to organize weekly rallies at the White House on all of his outrageous betrayals to the American people on every level, plus all of America’s allies he is endangering as well as America. This is a national campaign and referendum on Obama and also direction for Bibi Netayahu and each of you who cares for and loves America and Israel, if you just committed $25 or more, we can win this, because the only negative is that folks don’t know that I’m running and Schmutz is not well liked, even in this bastion of liberalism. So the decision is yours. 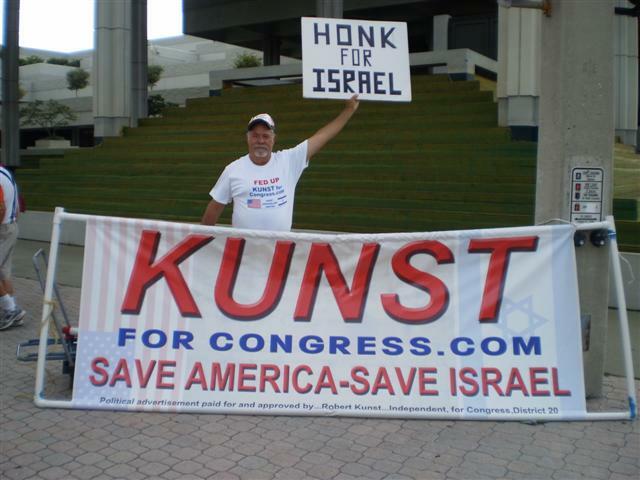 Keep silent and allow the same menaces to grow and consume Israel and America and the West, or fight back through www.kunstforcongress.com and use me to send this message nationally and internationally. Empower yourselves and help me to help you, Israel, Jerusalem, America and all of our efforts to get this great nation back on track for our own survival. Please go to the web site and donate via paypal on www.kunstforcongress.com or by mail to: “Kunst For Congress”, P.O.Box 402263, Miami Beach, Fla. 33140. Political Advertisement paid for by….Robert Kunst….Independent for Congress, Dist. 20. Department of Justice won a major victory Monday when the U.S. Supreme Court upheld the constitutionality of the “material support” statute. In a 6-3 opinion announced by Chief Justice John Roberts, the court held that the Constitution does not preclude the government from criminalizing speech and other forms of advocacy in support of designated Foreign Terrorist Organizations (FTO), even if the intent is to support the group’s “peaceful or humanitarian” efforts. “any property, tangible or intangible, or service, including currency or monetary instrument or financial securities, financial services, lodging, training, expert advice or assistance, safe houses, false documentation or identification, communications equipment, facilities, weapons, lethal substances, explosives, personnel (1 or more individuals who may be or include oneself), and transportation, except medicine or religious materials” (emphasis added). Next, the Court rejected the claims that the law violated free speech and free association guarantees in the First Amendment. Those challenging the statute sought to provide non-violent resources to support the humanitarian and peaceful efforts of terrorist organizations. The Court found that not only was there no distinction between the violent and non-violent wings of terrorist groups, but that terrorist groups benefit from any support given to them. The case on appeal involved groups and individuals who wanted to support the humanitarian and political activities of the Kurdistan Workers Party (PKK) and the Liberation Tigers of Tamil Eelam (LTTE)—groups that were designated as FTOs in 1997. Hoping to continue supporting the PKK and LTTE, the petitioners challenged the law, aiming to have it struck down as unconstitutional. As they explained in their opening brief to the court, “plaintiffs here seek only to safeguard their right to promote lawful, nonviolent activities through pure speech,” and the statute violated their First and Fifth Amendment rights by preventing them from doing so. That argument held some sway with a number of Justices. The three Justices dissenting, led by Justice Stephen Breyer, believed that in order to hold somebody liable for violating the statute, there must be a finding that the defendant intended one’s support to benefit the violent aims of a terrorist group. The Court was careful to explain that the ruling was limited to the immediate facts of the case. Justice Roberts pointed out early in the decision that “the Court does not decide whether any future applications of the material-support statute to speech or advocacy will survive First Amendment scrutiny,” but only that it was acceptable in the case of Humanitarian Law Project. Despite this warning, the opinion should end any future arguments that individuals can give non-violent support to promote the “peaceful or humanitarian efforts” to international terrorist groups. Among the cases which Monday’s decision could affect is Holy Land Foundation for Relief and Development. Evidence in that case proved that millions of dollars from the Texas-based charity went to Palestinian entities controlled by the terrorist group Hamas. The defense argued that, regardless of who handled the money, it was sent to help feed and provide medical care to needy Palestinians. Personally, I saw no genuine friendliness in the contrived TV interviews between President Barack Hussein Obama and Prime Minister Binyamin (Bibi) Netanyahu. Their facial expressions, their body language and finally, their words of compatibility were empty of meaning. Trusting Obama is not exactly what an intended victim should do. Granted, we were not privy to the real conversations but, I suspect that Obama dictated terms and Netanyahu tried to agree without increasing the rage Obama feels toward the Jewish Nation/State. Obama needed that public sham of saying Israel will always be America’s ally and friend. The major “sound-bytes”: “America and Israel bonds are unbreakable” and “Israel will always be America’s ally and friend” were necessary for Obama’s upcoming mid-term election campaign to keep his hold on a Democratic-dominated Congress. Those vacuous statements simply meant that he would play the political game of encouraging Israel and the Christian Zionist voters to ignore his pro-Arab stance in time to win control of the Congress in November. A great deal of what really went on in private will show up in what Netanyahu actually does. Will Bibi keep his word that the freeze on housing construction will end, as scheduled, in September? Or will he cook up some political double-talk to justify extending the halt of construction in Judea, Samaria and Jerusalem? I personally think he will cave and further confirm that he has a flexible rubber spine. Will Bibi pretend to himself that direct talks with Mahmoud Abbas (aka Abu Mazen) will not result in a Palestinian State with a confederation of Fatah and Hamas? Bibi will put into any agreement some useless unenforceable terms, such as the Palestinian entity will be disarmed and perhaps guarded by NATO or the UN as was done in Lebanon. I personally think that Obama will plunge ahead in tying America to Islam until one of the Jihadist sleeper Muslims blows up an American city (G-d forbid). Then Obama will be impeached and the President’s men, aka advisors, Czars, Czarinas, Islamic fellow travelers in America’s Intel Agencies and Centcom (Central Command of the Middle East) will end up in Federal Prison just like Richard Nixon’s collaborators. Can anyone trust Obama on any matter? Generally not, although he lies with convincing elegance as to be expected of a sophist who can jump to any side of an issue and argue cunningly. However, when it come to the Jewish Nation/State of Israel Obama’s bias is consistent. Can Muslims trust Obama? Yes and no. If what Obama has done against the Jews and Israel in deference to Islam appeals to Muslims, they should be delighted with a “friend” in the White House – for now. However, some Muslims believe Obama is in alignment with Koranic Law which teaches that a Muslim can act as an agent for Islam and lie to the “infidel” (non-Muslim). Presently, many indicators are surfacing that speaks to Obama’s alliance with Islam. We just heard (July 9th) that Obama instructed Charles Bolden, the head of NASA to reach out to Muslim dominated countries and help them “feel good” about their contribution to science, math and engineering. Presumably, that would include bringing Muslims into NASA’s technology of building and launching space-capable rockets or, otherwise, learn technology to be used for missiles. Let us recall that on March 2, 2009 Obama – through his Secretary of State Hillary Clinton, pledged $900 million dollars to Muslim Arab Palestinians, claiming none of it would go to Hamas. Also (while America is drowning in $13 trillion of debt) on June 10th Obama offered a new package of $400 million to Muslim Arab Palestinians in Gaza – which is controlled by Hamas. Look at the proposal that was put forth April 17, 2009 by King Abdullah of Saudi Arabia. It states that Israel would receive “normal relations” with the Arab world in exchange for a full withdrawal from the entire Gaza Strip, West Bank, Golan Heights and eastern Jerusalem – a full withdrawal to the 1949 Armistice Lines. Obama pledges a State to the Palestinian leader. Also, we recently learned that Obama ordered Centcom (Central Command of the Middle East) to collaborate with Palestinian and the Arab Muslim nations to force Israel to abandon Judea, Samaria and Samaria so a Palestinian State could be invented with Jerusalem as its capital. Are you getting the feeling that the meeting between Obama and Netanyahu was merely a public relations event but, in reality, Netanyahu was threatened to quietly go along with Obama’s Islamic plans for the region? Or else?! To conclude: Obama has consistently refused to actually stop Iran’s development of Nuclear Weapons and, instead, used a policy of “outreach” to build friendship with Iran and Syria – even as they supplied the Terrorists to kill American soldiers. Clearly, Obama will be a one-term President unless Congress impeaches him before 2012. While Brits are piling on Obama for going after BP’s worst American ecological disaster, the USA will hopefully kick the butts off England in soccer on 6/12/10. It’s obvious to the 69% of the U.S., that Obama has failed miserably on dealing with the ‘slickers’ and ‘slugs’ in BP, not only with their lies and cover ups, but failures to even consult with the families of the 11 BP employees killed in the explosion on 4/20/10. Who said BPers were responsible? That Obama has gotten $80,000 from BP and two months later has yet to meet with that ‘stiff upper lipped’ CEO Hayward of BP, only means that Obama was so busy selling out Israel and in bed with Hamas, Abbas and everything Muslim, so that cursing Israel has also brought this curse to America, namely BP ad nauseam. One would have thought that England, which is so far up the “Shariah” behind in groveling to the very Islamic Nazis aligned with Hitler in WWII and today, would be happy with Obama, who shares the same antisemitism. After all, when England recently refused to allow a TV ad from Israel which showed the Western Wall, and England maintained that this was Arab, the antisemitism and attack upon the Jewish faith was obvious. After all the Western Wall is the lst and 2nd Temples of historic Jerusalem, Jewish …for 3000 yrs. and millions of Jews were murdered for. Judaism is 3000 yrs. older than Islam, but why quibble with facts with England’s historic Jew and Israel bashing. Why shouldn’t England cater to those very Muslim oil sources and the politics that goes along with it, that included keeping the Queen out of a visit to Israel, while Ferggie was also offering access to royalty for a hefty sum. But then abdication from the throne in WWII, wasn’t because of ‘love’ of a woman, but because the King was in love with Hitler. Oops. Can we say such truths? As BP compromised on safety, security, and everything to do with this horrendous disaster, to make a fast buck on, and the most sordid history of any oil company and also with more dead as a result, it goes along with England’s anti-Jewish politics. England’s Chamberlain in the 1930s, played out his ‘land for peace’ insanity with Hitler, by trading the Sudentanland for a piece of paper that brought on WWII and 60millions dead and nearly 7 million Jewish men, women and children exterminated. England, wanting the oil went along with the Mufti of Jerusalem to make sure the Jews wouldn’t escape Europe and come to Palestine. The Jews then were called the Palestinians. Then England, during the war refused to bomb the rail lines to the death camps that might save some Jews. Then England allowed those who had participated in the slave labor of 14millions worked to death or led to the gas chambers, those corporate execs were also allowed to escape along with the mass murderers. England even allowed in, after the war, thousands of Nazi mass murderers, including 125 ‘einsatzgrupen’, which were the killing squads before the gas chambers, that executed 1 million Jews and no one was ever put on trial. Then England prevented Jewish survivors of the concentration and death camps to go to Palestine, and England was again up the behind of their Arab masters and instead interned the Jews in British concentration camps on Cyprus. Before all of this, England had ignored its own Balfour Declaration of a Jewish Homeland in Palestine and broke the League of Nations allotment of territory by giving what was going to the Jews to make Jordan, which wants nothing to do with the Arabs in West Bank or Gaza, then or now. Then the English have gone out of their way to dump on Jews and Israel for having beaten the Arabs in 5 wars and 2 intifadas by those committed to finishing what Hitler started, while cowardly denying the Holocaust to begin with. There are more anti-Jewish attacks in England today and attempts not to teach the Holocaust, because it might offend the Muslims. Then England ignored the 900,000 Jews thrown out of Arab countries in 1948 and all properties confiscated by the Arabs. Israel would take in the 900,000 Jews. Meanwhile, Israel, including Judea, Samaria are all in the Bible, upon which Christianity is based and this land was been given by G-d to the Jews in a Covenant that is over 5000 yrs. old and 3000 yrs. older than Islam. In the Bible it states exactly where each of the 12 Tribes of Israel were to go and reside. Meanwhile, Abraham, the lst Jew, bought his burial place for him and his wife, his son Isaac and his wife and his son, Jacob, his wife, 3000 yrs. before Islam. However, the Muslims have had control over the Patriarchs and Matriarchs of the Jewish faith for over 1700 yrs. and no Jew could go up beyond the first 7 steps until 1967, when Israel liberated this holy sight. Other Jewish holy sights, such as Joseph’s, Benjamin’s tombs and other holy sights have been attacked and destroyed by the Muslims, no different than the PA trying to erase any idenitity of Jews there with the lst and 2nd Temples, and no different than the Muslims/Taliban, who destroyed the Bhuddists shrines in Afghanistan and England was/is silent about all of it. Of course destroying property comes second to Muslims actually attacking Christians all over the world, and Hindus and Bhuddists, killing thousands of their fellow Muslims and all ‘infidels’ including Jews. But the English, with their ‘stiff upper lips’ have no problem groveling to the very forces screaming “Death to Israel”, “Death to America”, “Death to England”. Now the planet is paying for over 15,000 New Islamic Nazi terrorist attacks since 9/11, sponsored by Saudi Arabia, that other oil giant also in bed with BP/Amaco, etc. ad nauseum. Now we get to the wimps in England slobbering at the thought that Iran’s “Little Hitler”, who also denies the Holocaust, will get their nukes to use against the Jews and destroy Israel, but will also soon discover that those same missiles will also be aimed at London, etc. Need I remind the Europeans that you didn’t want your Jewish doctors, scientists, musicians in killing all those millions of Jews,and to steal their properties, and now you wonder why 20-50millions Muslims are taking over Europe, so that the future will be all about them and Sharia and all of Europe is losing its own identity in each country. Bless Israel and be blessed. Curse Israel and be cursed. “Jew-Hatred” takes it toll and has its consequences. So England’s Lord Tebbit, accuses Obama of ‘buck-passing’ and ‘beating up’ on poor BP, England’s #1 company, worth before the oil spill, $122billios and now only 1/2 that which of course means that all those British pensioners, will lose big time, not just the American people, since one out of 7 British pounds comes out of BP. Your indifference to America’s sufferings from BP are now on your very own doorstep and biting you in return. Lord Tebbit says: “This is Partisan Political Presidential Petulance”. Sounds like his Lordship has too much BP oil stuck between his teeth. This is just the tip of the anti-American attacks, while giving BP a pass, no different than those in the U.S. who think everything Obama does is a miracle, when we have the #1 fraud ever in the White House, he’s turned into the “Muslim House”. Meanwhile, grassroots Americans are boycotting everything BP, English and Obama. Those who thought Obama was the Messiah and have no problem with his getting in bed with the Islamic Nazis, and still keep hoping that Obama will finally do something about this oil spill and clean up, besides running for photo ops, are sticking with him, like BP oil is to our wildlife and beaches and in day 53, the horror is emerging on such a massive level. Then there is the environmental crowd, so awed by this Obama phony, that they keep allowing Obama to get away with everything, no matter what. Then there are those screaming boycott, who love the Islamic Nazis, and also those screaming boycott, who hate the Islamic Nazis, which is still 2/3rds of the American people. So while the battlefield between USA and England in soccer will last one day, the aftermath of what British Petroleum and the oil politics with the Arab/Muslim world and the Israel and Jew-bashing politics and attacks from both Obama and England are sure to last a very long period. I’m also urging a boycott of the Olympics in England. I have been to England many times and have a number of friends there, but will never spend another dime or farthing and as a candidate for the U.S. Congress, Dist. 20 in Fla., I am committed to weekly protests at the White House once elected, to make sure that Jerusalem and Israel isn’t divided and given to the very people who danced in the streets after 9/11. Monty Python questioned in one of his movies, whether any Brit had any balls. I support those few who do. So far, that answer is obvious with those running British politics and British Petroleum and British Pollution in both cases. My opponent, Rep. Debbie Wasserman Schultz, is a self-hating, Jewish sellout, and the face of Obama in Fla. who told the Jews we could ‘trust’ Obama on Israel and that has been a biblical disaster on every level by empowering our enemies. The S. Fla. Jewish vote, won the state for Obama, which went national and the Jewish vote made Obama President. Our fault, putting it mildly. We wanted to do civil rights and instead got a Jew-hater, who last year at this time in Cairo equated the Holocaust with ‘Muslim Humiliation’ as only he could trivialize such a horrible event, but no different than the British role in all of it. But then his AWOL indifference to the BP oil spill, is just one more horrendous annoyance that could destroy the ecology, jobs, fish and tourism industries, create a health crisis, etc., but what the hell does he care, when he can meet with Abbas from the West Bank and offer $400millions to the very guy who engineered the Munich Massacre of 11 Israeli athletes in 1972, and who also pushed the Intifada that killed thousands of other Jews. You think he has time to meet with BP’s CEO? This is the same Obama who ripped off Israel’s Bibi Netayahu on his trip to the White House and wouldn’t even meet with him and the same Obama who ignored Israeli intelligence on the “Gaza Flotilla”, resulting in the latest international dumping on the Jews in favor of the Islamic Nazis. You remember Hamas, the Gazans voted in after Israel voluntarily left Gaza, and the Hamas gang fired over 10,000 rockets into Israel, the world didn’t care about and Hamas is committed to Israel’s destruction but Israel is supposed to feed, house and make sure that its enemies have everything it needs to finish what Hitler started. Isn’t that the British way? Anyhoo, I am not a self-hating Jew and my campaign is an international protest against Obama, Hillary, Schultz and the rest of the crooks in Congress, the EU, England, the UNazis, etc. who all want the Jews to stop being Jews, give in, give up, stop resisting and go back silently into those gas chambers again. We know why there was an American Revolution Against England the first time. Now, there is another American Revolution in motion to boycott BP, England and Obama, all part of the same problems and catering to all of our enemies. Shalom International, I am president of www.defendjerusalem.net which has done 287 rallies and events and 1192 news interviews, including BBC, since Oct. 2007, as the #1 pro-active Jewish movement with a great deal of Christian support. I am not a politician, just a caring native born on Miami Beach, Fla. who understands “Paradise”. I never bought Exxon after the Valdez and I will never buy BP, or England again. It’s the least I can do for my faith and my love for Israel and America and those who feel the same. This morning I spent several hours at the Hallandale, Fla. Community Center to honor all the men and women who have given life and limb for our freedoms on this Memorial Day. I also met some wonderful veterans and others also there for this ceremony and let them know of my campaign to protest Obama/Hillary/Schultz’s attempt to divide Jerusalem and Israel, that would mean the end of the Jewish state, and appease the very forces who want “Death to Israel” and “Death to America”. My way to protest is in the streets and also in running as an ‘independent’ Activist,in the Nov. general elections for the U.S. Congress, in Dist. 20. I had a great many folks give me positive feedback and again experienced many who dislike Schultz for a number of reasons. Also, I saw 4 major Democrats, who I know, who ignored me completely, only revealing to me that Schultz is vulnerable and their rudeness was directed to me exposing and opposing the very forces in bed with the Islamic Jihadists and Nazis constantly on the attack as they were today in a flotilla trying to break the Israeli blockade of Gaza. They obviously think Israel has no right to defend itself, let alone to exist. One key fireman also told me that Schultz completely ignored him as a resident of Davie, when she also lived there and he was trying to get EMS into the City of Davie who was outsourcing to private companies and Schultz refused to help overcome this issue even while getting the endorsement of the fire department. I was also made aware today that there is no National WWI Memorial to honor the 116,708 killed in that war and the 205,690 wounded and I would certainly support such an effort. I don’t understand why our government keeps waiting to make this important statement that honors its service men and women, while still alive. No they rather argue over ‘don’t ask, don’t tell’ politics of division. How about a ‘thank you’, regardless of their affectional and sexual preferences as consenting adults, that have been there since the beginning of America? How about America needing to respect and support all who have made these sacrifices. Yet, we see a huge number of veterans today who are unemployed, homeless, struggling with health care, etc. and I keep asking why? How does this government send so many to do its battles and then abandons them once they come home? Why should vets only go to Veteran’s hospitals and not just have a card to go to any hospital and avoid long waits for appointments, let alone long drives and let the government pay for this health care as they would at the Veteran’s hospitals? Why put them through more crisis and stress? Where is the help for burial? Where is the support for their families? Below is a video in which Schultz supports the passage of ‘hate crimes’ legislation against gay and blacks, which I also support, but Schultz won’t support ‘hate crime’ legislation for those in the military or veterans. Has she lost her mind? These folks are sacrificing everything and yet she denies them protection from discrimination back home? This is the same “J St.” Schultz, who with Obama ,wants to divide Jerusalem and Israel and give it to the very forces who danced in the streets after ‘9/11’. What kind of Jew would divide Jerusalem, Jewish for 3000 yrs. and millions of Jews were murdered for? Schultz is that kind of Jew. I am also Jewish and would never sacrifice or betray everyone on this issue. My organization, Shalom International (www.defendjerusalem.net) has done 279 rallies/events and 1174 news interviews since Oct. 2007, through to May 31, 2010. Obama is such a coward to equate the Holocaust with ‘Muslim Humiliation’ in his Cairo speech in June 2009, while purposely ignoring 5 Arab wars and 2 intifadas to kill all Jews. Obama won’t go to the Muslims and ask them to divide Mecca for peace, but has no problem, demanding that the Jews divide Jerusalem, which would mean the end of the Jewish state, while attacking our Jewish Covenant with G-d, for 5000 yrs. and is thousands of years older than Islam and Schultz keeps her mouth shut about all of these insults and attacks from Obama and gang she is part of. Obama says that if Israel protects the burial place of Abraham, Isaac and Jacob and their wives, it is a “provocation” to the Muslims. Abraham the first Jew, bought this property to be buried in and is again thousands of years older than Islam, yet no Jew could go up the first 7 steps in 1700 years under Muslim control, till the Israelis liberated it in the ‘Sixth Day War’, in 1967. Yet, Obama wants the Jews to give it up and again attacks our faith and Schultz, who told the Jews in S. Fla. that we could ‘trust’ Obama on Israel is again ‘silent’ about this attack upon our faith, history, Covenant, identity and everything Jewish. Schultz’s impact with the S. Fla. Jewish community gave Obama the Fla. victory that made it nationally and his election and yet Obama has been the worst against Israel on every level. If he can attack Israel and Jews, this cowardly behavior to side with America’s and Israel’s enemies, is not just dispicable behavior, but also shows weakness and also aids and abets the terrorists in violation of everything Americans are fighting wars against and dying in this process, by the thousands. Obama didn’t lay a wreath at Arlington today and went to do it in a cemetery in Chicago that then got rained out on. Homeland Security head, Napolitano recently said that the U.S. has more to fear from returning veterans, then this administration’s insanity to keep the Islamic Jihadists from being identified on any level as the real threats. Imagine a Mosque near ‘Ground Zero’, and another slap in the face to the 3000 murdered there, and their families and all Americans. Obama, Hillary, Schultz ad nauseum see this as religious freedom, while the Islamic Jihadists see this instead as a huge victory over the “Infidels” they murdered. This is a major victory by Saudi Arabia, responsible for ‘9/11’, over 15,000+ Islamic Jihadist attacks since, global oil blackmail on the world’s economy, that causes over 30,000 deaths daily from starvation, and it is Saudi Arabia’s ‘road map’ to divide Jerusalem and Israel, that Obama is pursuing and Schultz is supporting. No wonder Obama ‘bowed’ to the Saudi King last year. Our priorities are screwed up on every level and if we are betraying America’s #1 ally, which is Israel, then how can you trust Obama on any other foreign or domestic policy issue and the bottom line is that we can’t. Obama is allowing Iran to get its nuke it will use against Israel and America and the West. Sanctions are meaningless which is Schultz’s inane focus, while time is fleeting and the dangers grow out of control. Israel may have to attack Iran even before the Nov. elections. Today’s Hamas attack in the flotilla event is just one more pretense to this proxy from Iran to keep pushing Israel on every level. Israel could well be in a new war, from these politics, this summer , while Obama/Hillary/Schultz keep catering to these evil forces and empowering them to keep attacking Israel and also attacking America. A vote for Kunst for Congress is to mobilize a national and international protest against these stupid and dangerous politics by Obama, Hillary, Schultz. Please see this video below and please see the ‘big picture’ and ‘pattern’ that exists to undermine Israel, our military, America and to abandon not just our ally, but let the world know that Obama isn’t with them either. Who is in charge with the largest environmental disaster in U.S. history with the BP oil spill? How does the oil industry play a role in Middle East politics, with Israel not having any oil? How are we going to get through all of this with the same crooks and incompetants in Congress, from both parties and in the White House, only concerned about themselves and nothing about this nation or Israel or our freedoms, or those sacrificing to preserve those freedoms. When will America say ‘thank you’ when it needs to and stop ‘bowing’ to our enemies? Kunst is running as an Independent to unseat Debbie Wasserman Schultz’s FL House Seat, in District 20. If you’re not in District 20, face it, all of FL District Representatives make up the FL House, and even though you can’t vote for him, you still want someone there who supports most of the issues you support! When it comes to Israel & a United Jerusalem, HE DOES!! More so then any candidate I’ve come across. Not just by words, but as you know, he’s a true activist for the noble & just cause so near & dear to you! In every email or news alert he refers to the schultz/obama/biden gang who want to divide Jerusalem, appease the Arabs & weaken our beloved America & Israel. Do you have any idea how much ‘outside’ support money Debbie gets? More than 1/3 of funds contributed!! Check your voter’s registration card. I think you are either in District 22, Ron Klein, or District 19, Ted Deutch. Both districts cover parts of Boca Raton. As to the ’blackballing” of Bob you speak of, who exactly? The self hating Jewish groups like AIPAC and JSt, along with Obama, who are deciding how to divide Jerusalem and sell it to stupid Jews who don’t have a clue? It’s a nightmare! G_d help us all!! My dear friend, I took the time to write all this, I want you to take the time and read Bob’s latest email. (JUST BELOW) It will give you an idea where Bob Kunst stands & what he does, not just here in Florida, or in the USA, but internationally. You said you want to know about him, so please read it all, & reply to me what you think!! His message must be heard, and his candidacy gives him the forum to speak out. BTW, the Million Mensch March is in Washington DC in June. Donate $25, $100, $1,000 or more. Every dollar counts, Thank You.